The ZEPIC-DE is a stand-alone dragging equipment detector system. AS such, the ZEPIC-DE provides all the necessary features and functions required to monitor dragger paddles, wheel sensor, control radio communications and simplify scheduled maintenance tasks. System configuration is accomplished via front panel display and pushbuttons, no laptop required. The milepost number is used as the system ID in all communications and serves as the remote access code when DTMF codes are used. Additionally, the unit offers a data logging function that can store data from 10 train moves with up to 5 defects per train. The built-in audio overlay track circuit provides train detection and serves to activate the system and minimizes false activations due unauthorized personnel on the tracks. The ZEPIC-DE is packaged in a simple, rugged B2 sized enclosure, making it ideal for retrofit application, reducing the need for new construction. 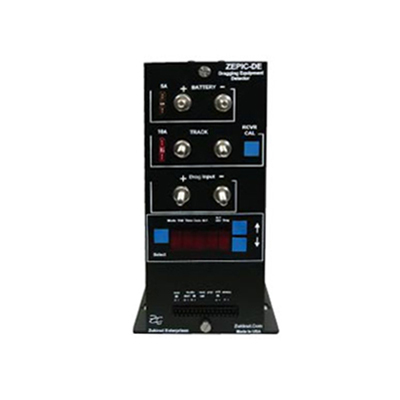 Of further value is the ability to convert a standard ZEPIC into a ZEPIC-DE with the addition of the dragger logic module and front panel change; reducing spare equipment requirements while providing field personnel equipment flexibility and consistency in setup and use from product to product. 12VDC interface to dragger paddles. Manual input for last Msg repeat. Radio interface. PTT, Audio Output, Audio Input and Hold Off. Built-in DTMF decoder provides Msg repeat capability with analog radio. Expandable for Hi / Wide load applications.